… Father’s Day approaches complete with its full complement of both “useful” and "desirable" presents. Bars of manly coloured soap (mostly sandstone and green) for “homme” and pairs of rainbow coloured tie dyed socks have now given way to such gems as iPod dock toilet paper holders and slippers with torch lights that have 400 watt bulbs in the toe … presumably so you can make your way really quickly and completely undetected to raid the refrigerator at 4am, before your toes are burnt to a crisp. I have decided that my Dad is going to get some of the good old Father’s Day present stand by … chocolate (you've probably noticed that chocolate appreciation is in our family DNA). 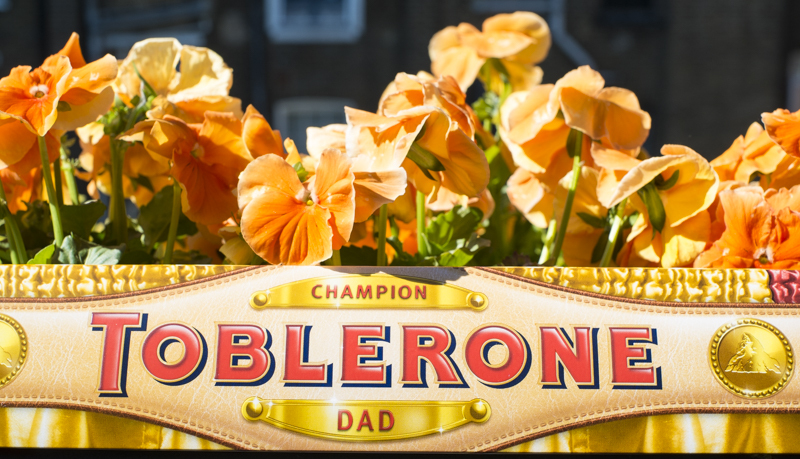 But not just any chocolate oh no … he’s getting a giant Toblerone “Champion Dad” !!! 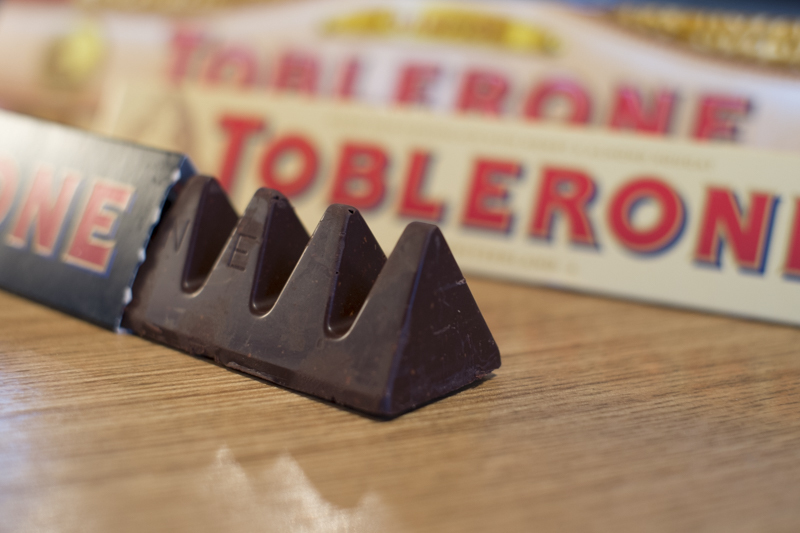 Like many things chocolate Toblerone was invented in Switzerland, and by none other than a chap called Theodor Tobler in 1908 … see before television people just sat around thinking “I’m sooooo bored, oh I know, I’ll invent something, in fact I’ll out invent my neighbour”. Well … Theodor’s neighbour was Maximilian Bircher-Benner, the inventor of Bircher museli, so I am not sure who out invented who there in the grander scheme of good for you things. Toblerone bars come in white, milk, and dark chocolate versions all with little bits of honey and almond nougat all through them. The name is a portmanteau (love that word … ) of “Tobler” and “torrone” a type of Italian nougat. 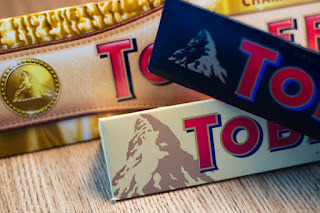 Everyone thought that the Swiss Alps, and their pride, the Matterhorn, were Theodor's inspiration for the shape, although his sons would later “reveal” that what had really inspired their Dad was the pyramid shape formed by the famous dancers of Folies Bergeres in the finale to their act in Paris. 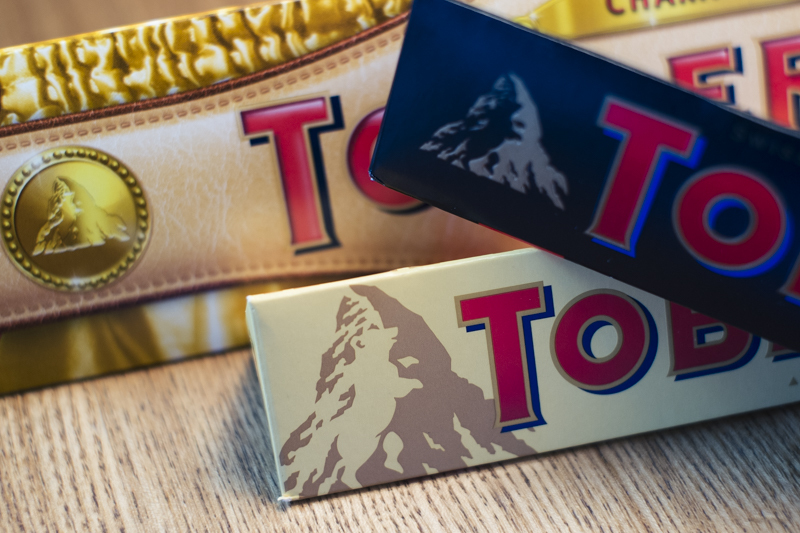 The Toblerone icon does feature a relief of the Matterhorn, and until I looked all this up I had never noticed that there is an image of a bear hidden in plain view in the icon. Like all things hidden in plain view, once you see it you can’t see anything else. Why a bear I hear you ask? (yes you did I heard you) … well where in Switzerland did Theodor live? … in Bern naturally! I never saw that "bear" before! Actually, I don't think I gave much thought to the package at all. I was in too much of a hurry to eat that lovely chocolate. We don't celebrate Father's Day until September here in AUS. I am afraid I cannot see the bear in the icon. Well, Ted (and the Doll), you have once again educated me about a most important topic: chocolate. Yes, once you see the bear... wow! One can't go wrong with chocolate!